It’s the second month of FFG Live, we’ve just moved onto our brand-new set, and we can’t wait to keep showing it off with more and more livestreams, coming to you twice a week! Every Tuesday and Thursday at 1:00 PM Central Time, we’re streaming live on YouTube and Twitch, bringing you the latest on upcoming new titles from Fantasy Flight Games. Last month, we dove into the Convergence set of Star Wars™: Destiny, showed off roleplaying in the Android universe with Shadow of the Beanstalk, announced the Age of Ascension set for KeyForge, and much more! You can find all of our past broadcasts archived on our YouTube page, but for now, we want to show you what you can expect to see from FFG Live in March. To kick off our livestreams in March, we’ll be showcasing an exhibition match of Star Wars™: Legion between designers Alex Davy and Luke Eddy. They’ll be playing one of our Organized Play operations on a 3’ x 3’ play surface, and showing off what some of the newest miniatures can do on the field of battle, including the X-34 Landspeeder and the TX-225 GAVw Occupier Combat Assault Tank. On March 12, we turn to the skies of the Star Wars galaxy, bringing the Clone Wars to life as designers Frank Brooks and Max Brooke take their Galactic Republic and Separatist Alliance squadrons to the tabletop in X-Wing™. They’ll be showing off some of the newest ships from the upcoming Wave III, and this is the perfect chance for you to see how these ships fly in action. 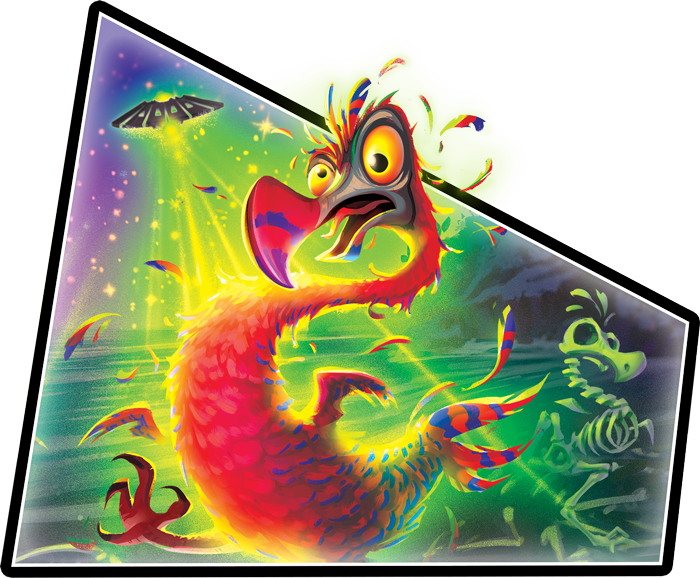 Throughout the month of March, there will be plenty of opportunity to see more games of KeyForge and new decks from Age of Ascension. 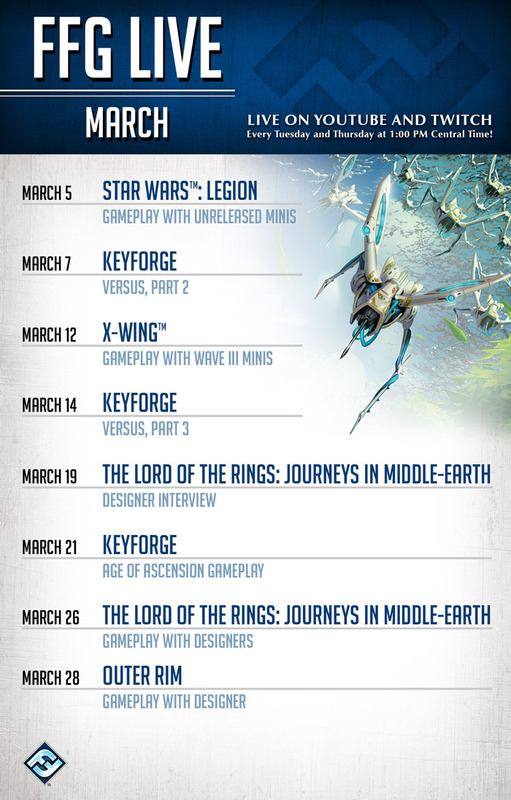 On March 7 and March 14, we’ll see the next two entries in our KeyForge Versus series, continuing to follow our players as they go deeper into the game, uncovering new decks, testing new strategies, and exploring different ways to play with your Archon Decks. Then, on March 21, we’ll have a game and opportunity to ask some pressing questions with designer Brad Andres! Finally, we have streams dedicated to some of our biggest upcoming board games. On March 19, we’ll have an interview with the designers of The Lord of the Rings: Journeys in Middle-earth—Nathan Hajek and Grace Holdinghaus. Following up a week later, we’ll play through the first two scenarios of Journeys in Middle-earth, giving you just a taste of what awaits for your own adventures in Middle-earth! Then, on March 28, we return once more to the Star Wars galaxy, showing off the gameplay of Star Wars™: Outer Rim with designer Corey Konieczka. Join us on our YouTube and Twitch channels for FFG Live, every Tuesday and Thursday at 1:00 PM Central Time. Don’t forget to subscribe so you never miss a new video or livestream—we hope to see you there! Streaming every Tuesday and Thursday at 1:00 PM Central Time on YouTube and Twitch, FFG Live is your invitation to come behind the scenes with us at the FFG studio. We’ll have showcases of new and upcoming products, gameplay from our hottest new offerings and older classics, panel discussions with members from every department at Fantasy Flight Games, and much more. We can’t wait for you to join us!